This toy is not a foraging toy, because it does not contain food, but it does fulfill my other criteria on this site: cheap (or free) and easy! A small book or booklet that you don’t want. Crappy little recipe books, manuals from appliances you don’t need, stuff people put through your door. Reader’s Digest size is ideal – Old Reader’s Digest magazines themselves are ideal! Here’s Pepper with one I made for her (directions follow below). 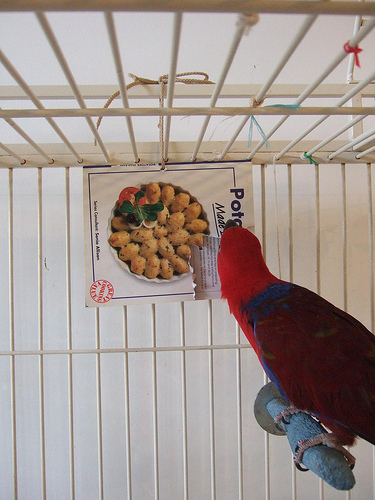 For Pepper’s toy, I used an old cooking booklet, about potatoes. It was about to go in the trash when I decided to use it. To make the toy, all you need to do is hang the book up. There are 2 was to do this. I got my husband to use his drill to drill a hole through the book, and I threaded the string through that. An easier way is to lay the string in the open book, like a bookmark, close the book, then tie it to the cage bars.